A couple weeks ago, Mike wrote about the Yankees doubling down on Miguel Andujar’s defense. The key takeaway was that Andujar’s struggles aren’t for a lack of effort. His work ethic is virtually unparalleled, though at some point, the results need to follow. The biggest issue with Miggy’s defense has been his range, something Mike also addressed last summer. Getting Andujar into a comfortable stance in order to make a quick first movement is important, but what about moving Andujar a few steps back? Would he be more comfortable standing a few feet further away from the infield grass, thereby giving him more time to get to wide grounders? It seems pretty logical. Of course, it could also be too good to be true. One of the nice things Statcast shares is defensive positioning data, which tells us how far away players stand from the plate prior to each pitch. Using this information, I figured we could see how Andujar’s counterparts position themselves, while also looking to see if their depth has an effect on their performance. Statcast tells us that the typical third baseman was positioned 113 feet away from home plate last year. Andujar was a foot closer to the grass, checking in at 112. Others ranged as far as 118 feet away (Alex Bregman and Matt Chapman) to only 107 feet deep (Johan Camargo). To try to assign some meaning to this, I wanted to compare the depth to player’s range and arm strength. My theory was that players who play deeper have better range, stronger arms, and slower first steps than those who play shallower. For range, I used Range Runs (RngR), which is a component of UZR. Admittedly, UZR is far from imperfect but it’s just about the best information available in this instance. Of 31 third baseman who played at least 500 innings at the hot corner last year, there was no correlation between RngR and depth. Bummer. What all this says to me is that positioning is a matter of personal comfort. There are times when a scouting report will affect a third baseman’s location on the diamond, such as bunt situations or against pull-happy lefties. Ultimately, positioning isn’t a one-size fit all solution. There’s a wide range of defensive positioning, again illustrating the fact that its more of a preference than anything else. To no one’s surprise, Chapman sits at the top with some outlandishly great numbers all around. He just so happens to play far back. On the other side of the coin, there’s Beltre. He’s one of the best fielders to ever play the position, yet he’s much closer than Chapman. Out of curiosity to see if he moved in as he got older, I went back to 2016 (the earliest available), but Beltre hasn’t moved. Again, this points to depth being whatever each player favors. Even though a few defensive metrics don’t correlate well with depth, that doesn’t mean Andujar would be wasting his time by trying something different. After all, if Chapman plays 118 feet back, why shouldn’t Andujar give it a shot? Miggy has a pretty fantastic arm himself, so it’s not a matter of arm strength that prevents Andujar from trying it. If he’s comfortable playing deep and has some positive results to show for it, great. If not, he can always revert to his old location. This is the perfect experiment to conduct during spring training. I don’t want this idea to come off as some sort of panacea. I’ve already noted that there isn’t a correlation between depth and a few stats, but what I haven’t gotten into are certain factors specific to Andujar that need to be considered. For one, Andujar has a bad habit of double clutching before throwing. This is already an issue that could be exacerbated by playing deeper, which gives the runner extra time. On the other hand, Andujar has a rocket for an arm. With his arm strength, I don’t think a longer throw would be an issue. It’s just a matter of correcting the double clutch, which ostensibly is teachable. Although this idea was born because of Andujar’s lack of range, I wouldn’t have proposed it if he didn’t have the arm for it. Spring training is right around the corner and I’m curious to see if there are any noticeable differences for Andujar. 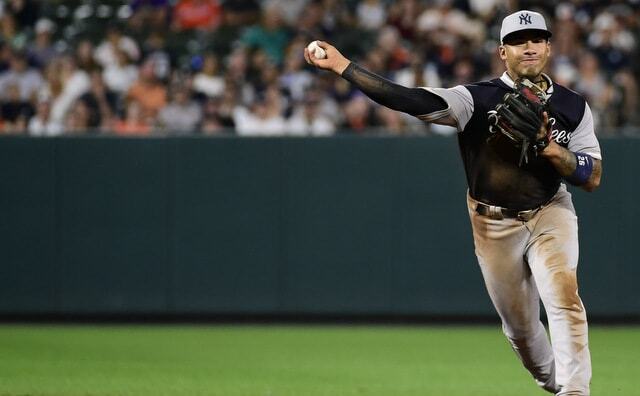 We’ve heard about how much work he’s put in this offseason, and given the apparent lack of desire to sign Manny Machado, Andujar’s fielding is going to be heavily scrutinized. The unfortunate thing is that it’s so difficult to notice changes, particularly when watching on TV. There’s no view of pre-pitch positioning or a shot of a fielder’s first step. It might not be until partway through the regular season, when some of the returns for various metrics come in, that we can get an idea of any changes or improvements made, if any. As Mike noted a couple weeks back, it’s fantastic that Andujar has the drive to get better. I’d much rather have that than a terrible defender who doesn’t care. Still, results need to come at some point, otherwise he’s going to be untenable at the position. Moving him off of third is always an option, but his bat wouldn’t be as valuable elsewhere. The Yankees know this, and will exhaust every last option before conceding. If no stone is going unturned, perhaps moving Andujar back a few feet is worth a shot. Barring a total surprise, the Yankees will not sign free agent wunderkind Manny Machado. Negotiations between the two sides are said to be “either dormant or completely dead,” and gosh, that sure sounds bad. I won’t rule the Yankees out completely on Machado (or Bryce Harper) until they sign with another team. Things don’t look good right now though. Rather than spend on Machado, the Yankees are taking a league minimum flier on Troy Tulowitzki, and they signed DJ LeMahieu to be a veteran insurance policy. Should Tulowitzki get hurt or underperform, LeMahieu will take over at second with Gleyber Torres sliding over to short. If Tulowitzki actually works out, LeMahieu will assume the Neil Walker role and move all around. Andujar’s consistently strong effort instills confidence within the Yankees organization that he will benefit from his offseason program and improve his defense. He has worked extensively with instructors this winter, and in the past few days, Yankees manager Aaron Boone was in the Dominican Republic, partly to see Andujar’s progress and spend time with him. Last month Erik Boland noted Andujar had spent time in Tampa to work with infield instructor Carlos Mendoza. “He came down for a few days a couple of weeks ago. We always talk about his work ethic, and the fact that it’s the offseason and he’s already working at his craft, not just physically but baseball-wise,” Mendoza said. Work ethic won’t be an issue with Andujar. He’s always been regarded as a hard-worker — the guy takes more pregame grounders than any player I’ve ever seen in my few years as a BBWAA member — and if this third base thing doesn’t work out, it’ll be because he lacks the skills and refinement. Not because he didn’t try hard enough. That’s good. Effort and commitment are necessary to get better. The Yankees sent Andujar home this winter with a workout plan designed to improve his first step and internal clock. Those are the top priorities. Andujar was sometimes a little slow to react to the ball off the bat and he sometimes took a little too much time getting the ball over to first base. We saw a few too many double-clutches last year. That has to improve. Speeding everything up is the top priority. As good as Andujar was last season — I get a ton of mailbag questions about trading him each week, but it wasn’t long ago that folks around these parts were irate Miggy didn’t win Rookie of the Year — it would’ve been very easy for the Yankees to replace him this winter. Trade Andujar for a pitcher, sign Machado or someone else to play third, and move forward. Heck, even now they could trade Andujar and install LeMahieu at third base (or Gleyber?) full-time, and markedly improve their infield defense. Instead, it appears the Yankees have doubled down on Andujar at third base, and that makes me happy. I’ve been an Andujar guy for a very long time, you know that if you’ve been reading RAB long enough, and I’m glad the Yankees are seem poised to give him another at third base. It would’ve been easy (and justifiable!) to move him elsewhere. Instead, he gets another chance. I like that they’re showing some confidence in him. Now, that said, the Yankees did remove Andujar for defensive purposes in the sixth inning (!) last postseason, and I imagine LeMahieu will replace him in the late innings of most games this year. In fact, I’d bet on LeMahieu being CC Sabathia’s personal third baseman this year given all the weak contact he generates to the left side of the infield by pitching righties inside with this cutter. Walker was Sabathia’s personal third baseman for that reason last year. LeMahieu gives the Yankees a safety net in case Andujar’s glovework doesn’t improve but he is not a long-term solution at third base. At least he shouldn’t be. Machado would’ve been a long-term solution at third base, assuming the Yankees do sign Didi Gregorius long-term. With no Machado, Andujar will — and should — get every opportunity to show he can be the long-term third baseman. The Yankees don’t have another option. It’s Andujar or no one. On one hand, that’s kinda scary. Andujar might never be even average at third. On the other, if you’re not going to be patient and give talented and dedicated kids a chance to prove you wrong, you’ll never develop players. Machado would be a great addition. I’d take him in a heartbeat. The Yankees probably won’t sign Machado though, and the next best thing is giving Andujar a chance to show he’s improved, with LeMahieu around as a backup plan. The offseason did not start well for the Yankees. 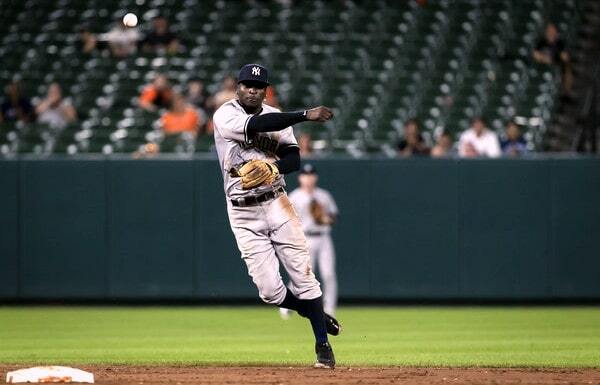 During Aaron Boone’s and Brian Cashman’s end-of-season press conferences we learned Didi Gregorius needed Tommy John surgery and would miss the start of next season. We still haven’t been given a definitive timetable for his return. May? June? September? We don’t know. The Yankees have kept us in the dark so far. No matter the exact timetable, we know Gregorius will miss some time next season, and that the Yankees do have to replace him. Gleyber Torres can play second base or shortstop and that gives the Yankees some options. I prefer finding a shortstop and keeping Gleyber at second, but there seem to be more second basemen on the market. “It all depends on the price point,” said Cashman a few weeks when asked about a Gregorius replacement. Give me another quality righty hitter over a lefty hitter simply for the sake of adding a lefty hitter. My top priority is defense though because geez, the Yankees are looking rough on the infield. Collectively, the infield was sixth worst in baseball this past season at -56 DRS (mostly due to Miguel Andujar’s -25 DRS) and that was with Sir Didi. Gregorius is the Yankees’ best defensive infielder and not by a small margin either. Now he’ll miss part of next season. Gray is as good as gone so we should probably ignore him even though he is still on the roster. Otherwise three of the four starters have run better than league average ground ball rates, and if the Yankees were to sign Dallas Keuchel (58.7% grounders) or Charlie Morton (49.6% grounders), they’d add another high ground ball rate pitcher. In Yankee Stadium and the AL East, you need ground balls. The Yankees get them. But can they field them? The Yankees, as presently constituted, are not poised to field a strong infield defense. They were able to mitigate the damage somewhat with infield shifts in 2018 — the Yankees allowed a .225 BABIP on ground balls while shifting compared to .282 BABIP on grounders with no shift — and I’m sure they’ll stay shiftin’ next season too. Otherwise Torres has been error prone in his brief MLB career, Andujar has been a mess at the hot corner, and neither Luke Voit nor Greg Bird is anything special at first base. The infield defense is not good. It’s not. While losing Gregorius is a blow to the offense — Didi hit .268/.335/.494 (121 wRC+) with 27 homers this past season and that includes his miserable May — the Yankees are better able to absorb the offensive hit than they are the defensive hit. They do have some offense to spare. That doesn’t mean I want them to replace Gregorius with a true all-glove/no-hit guy like Adeiny Hechavarria or Hanser Alberto. It just means they could survive offensively should they have to go that route. Realistically, signing Manny Machado is the only way the Yankees could replace Gregorius and not downgrade. Maybe signing Marwin Gonzalez. Maybe. The free agent middle infield market isn’t great and even a top trade candidate like Scooter Gennett is going to give you Gregorius level offense without the Gregorius level defense. There are very few players out there who can do what Sir Didi does at the plate and in the field at the same position. He’s awfully valuable. So, given the state of the pitching staff (rotation of ground ballers) and the state of the offense (dingers), I think the Yankees should prioritize defense with their Gregorius replacement. Offense would be great. I’ll take as much of it as I can get. I just think defense has to be the top priority. The rest of the infield isn’t good defensively and the Yankees are going to need someone to support the pitching staff in the field. The Yankees made two trades prior to the August 31st postseason eligibility deadline last week. The first brought Andrew McCutchen to New York in a three-player trade with the Giants. The deal had been reported a day earlier, so it wasn’t a surprise when it went down. It always seemed likely the Yankees would add an outfielder for September. They got a pretty good one. The second trade came out of nowhere. The Yankees landed shortstop Adeiny Hechavarria from the Pirates for a player to be named later or cash. Bryan Hoch reports the Rays and Pirates are paying pretty much his entire $5.9M salary this season. The Yankees are only responsible for the pro-rated portion of the league minimum, or roughly $88,000. A cheap pickup in every way. 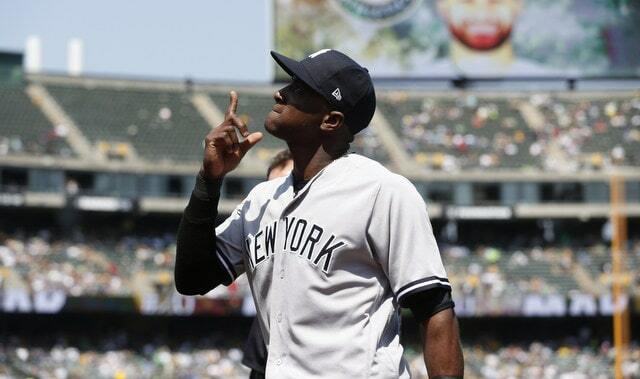 It was easy to wonder what the Yankees would do with Hechavarria after the trade went down. My first thought was Didi Gregorius would miss more time than expected. Thankfully that does not appear to be the case. But, even with Gregorius out, the team still had Tyler Wade and Ronald Torreyes as reserve middle infielders behind Gleyber Torres and Neil Walker. There’s always room for another infielder, sure, but it didn’t seem completely necessary. Hechavarria is 1-for-5 with a single with the Yankees but already we’ve seen his value. He’s a fantastic defensive shortstop. A clear defensive upgrade over the error-prone Torres and a better all-around player than Wade or Torreyes. Neither Hechavarria nor Torreyes will hit much. Hechavarria will at least play the heck out of shortstop. We’ve seen it already. Adding Hechavarria was one of those “improve the margins of the roster” moves that tends to raise some eyebrows at the time it is made before coming into focus. He serves two purposes for the Yankees. One, with Gregorius out, he improves the defense considerably. Gleyber is going to be on the field either way. It’s either Hechavarria’s great defense or Walker’s good bat or Torreyes’ okay all-around play. Hechavarria it is. 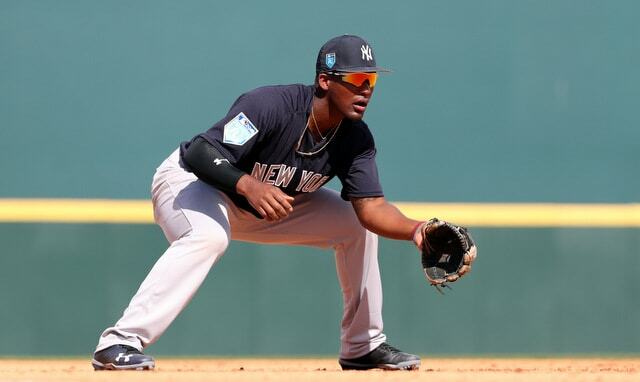 Secondly, when Gregorius does return, Hechavarria gives the Yankees a great defensive replacement for Miguel Andujar. Andujar has to come out for defense late in close games — I love the kid, but it has to happen — and, previously, the Yankees were playing Walker at third base, which is fine. Now it’ll be Hechavarria. It’s been a while since Hechavarria has played third (2012), but the defensive tools are all there, and I think he’ll be able to shift back there with no problems at all. It would be silly to expect much offense from Hechavarria. He’s a career .255/.291/.344 (72 wRC+) hitter with a .253/.286/.340 (68 wRC+) line in 2018. The best thing you can say about him offensively is that he won’t strike out excessively (16.2%). Maybe Hechavarria will go into a BABIP fueled hot streak at some point this month. That’d be cool. Otherwise, the Yankees picked him up to help an infield defense that has been underwhelming this year, and so far he’s done exactly that. All things considered, this has been a wildly successful season for rookies Miguel Andujar and Gleyber Torres. They might finish first and second in the AL Rookie of the Year voting (in either order) and both will almost certainly finish in the top three. More importantly, they’ve both established themselves as long-term infield building blocks. It’s awesome. Not great. I don’t take defensive stats as gospel — I don’t think they’re accurate enough to put an exact run value on a player’s defensive contributions — but they work well enough directionally, and both DRS and UZR tell us Andujar and Torres are below-average glovemen, especially Miggy. They’re also among the league leaders in errors. Errors can be nebulous. It is a universal truth that a lot of errors is a bad thing though. Based on the exit velocity and launch angle and trajectory and all that, Statcast says that batted ball from a right-handed hitter goes for a base hit 27% of the time. Statcast’s hit probability isn’t perfect — it doesn’t take into account shifts — but I like that there’s some science behind it. It considers how hard the ball was hit and where it was hit, and that’s not nothing. Per Statcast, that batted ball goes for a hit 27% of the time. Andujar didn’t even get a glove on it. His first step was a tad slow and the dive came up short. At the very least, you want your third baseman to knock that ball down and hold the batter to a single. Instead, the ball got by Andujar and rolled down the right field line, allowing the batter to get to second. That batter eventually came around to score too, which is kind of a big deal. That run isn’t entirely on Andujar, but his lack of range played a part. That play is scored as a double. It doesn’t show up as an error. It does show up in DRS and UZR though, and plays like that — Andujar’s lack of range have led to a lot of plays like that — are why those two metrics rank Andujar among the game’s worst defensive players. Can’t make an error on a ball you don’t get to, you know? A play that has to be made, clearly. Gleyber would be the first one to tell you that. That play is as routine as it gets — the batter, Adam Jones, flung his bat in frustration because he made such weak contact — and it was the third out of the inning. Instead, Torres booted the routine ground ball and the inning continued, forcing J.A. Happ to throw more pitches. Fortunately the error did not lead to the run, but Happ having to throw more pitches is not inconsequential. Torres made a similar error Friday night — that error led to a leadoff baserunner who later came around to score on a two-run homer — and a similar error Wednesday night, in the series finale against the Marlins. Before an error free nightcap in Saturday’s doubleheader, Torres made an error in three straight games, and all three errors came on fairly routine ground balls a Major League infielder has to convert into an out. In Andujar’s case, his defensive issues result largely from a lack of range. There’s a physical deficiency there. He can’t get to the ball quick enough. Andujar generally makes plays just fine when the ball is hit at him, or maybe a step or two in either direction. Anything beyond that has been a challenge. As for Torres, his defensive problems are careless mistakes more than anything. He’s there and in position to make the play, but he just doesn’t. Gleyber’s recent defensive issues are far more noticeable than Andujar’s — few things in baseball stand out as much as a routine play not being made — but it seems to me his problems will be much easier to correct. He’s in position to make those plays. He’s there. But either due to a lack of focus or improper technique — is he not getting his glove down in time? — he’s not making the play. That seems to be easily correctable, at least to me. With Andujar, we’re talking about developing more mobility and improving reads and first steps. That ain’t easy. It’s not easy and Andujar might never be able to do it. Not because he won’t work at it — I’m not exactly a seasoned BBWAA guy here, but I’ve never seen an infielder go through as much pregame infield work as Andujar, he’s out there every single day — but because playing third base is hard. He may never develop the quick reactions necessary for the position. Wouldn’t be the first guy. Andujar and Gleyber are both rookies who have yet to play a full MLB season. Development does not stop when a player reaches the big leagues, and, at this point, the only thing the Yankees can — and should — do is continue working with them. It’s too early to discuss a position change with Andujar and it’s too early to say Torres lacks the focus for the middle infield. They’re both struggling defensively this year, no doubt, but they just have to keep working at it. Again, they’re two rookies. Still lots of time to gain experience and get better. Sixteen games into the new season, the Yankees were playing thoroughly mediocre baseball, and their 8-8 record and +3 run differential reflected that. They had scored the fourth most runs in baseball at the time, so that was cool. They’d also allowed the seventh most runs, which was a big problem. Both the pitching and defense had gone bad. Since then the Yankees have gone 10-2 and outscored their opponents 74-31, and they look very much like the team everyone expected them to be this season. The Yankees lead baseball in basically every meaningful offensive category and they’re second in many others. They rank first in runs (164), homers (41), wRC+ (115), so on and so forth. A positive trend, that is. The Yankees have held their opponent to one run five times in the last ten games, and three or fewer runs nine times in the last ten games. Not once in those ten games did they allow more than four runs. At one point earlier this year the Yankees allowed 41 runs in a five-game span. They’ve allowed 41 runs in the 14 games since. Yup. We’re still in small sample size territory, and there are better ways to evaluate pitching than ERA, but the bottom line is the Yankees are allowing fewer runs. 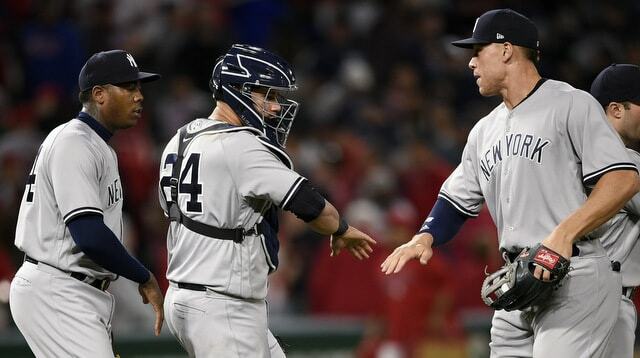 The rotation has been very good lately — even Sonny Gray turned in a quality outing last night — and the bullpen settled in a few weeks ago, even with Tommy Kahnle and Adam Warren hurt. To me, the improved defense is the most noteworthy development here. The Yankees do still lead MLB in errors, which is annoying, but they haven’t been happening as frequently lately. They committed 17 errors in the first 16 games and have committed only seven in 12 games since, with four of the seven coming in one game. That’s … better? It is better. Still bad! But better. I count three reasons for the defensive improvement. One, Aaron Hicks is back. He missed two weeks with an intercostal injury and getting him back in center field has improved the outfield defense overall. Two, Gleyber Torres has joined the Yankees. He’s already flashed some serious leather. How long has it been since the Yankees had a full-time second baseman who could do this? Probably not since Robbie Cano. Gleyber, if nothing else, has been a defensive upgrade at second. And three, Giancarlo Stanton looks way more comfortable in left field. It was always silly to say he couldn’t handle left after watching him play like five minutes out there in Spring Training. He’s a good athlete and a good right fielder, and now that he has more experience in left, he’s handling it well. I’m not surprised. Hicks, Torres, and Stanton have all helped defensively. You’re never really as good as you look at your best and never really as bad as you look at your worst. The Yankees couldn’t keep runs off the board earlier in the season and now they’ve turned into a run prevention dynamo. The real 2018 Yankees are somewhere in the middle. The Yankees did allow the fourth fewest runs in baseball last season with largely the same cast of characters. 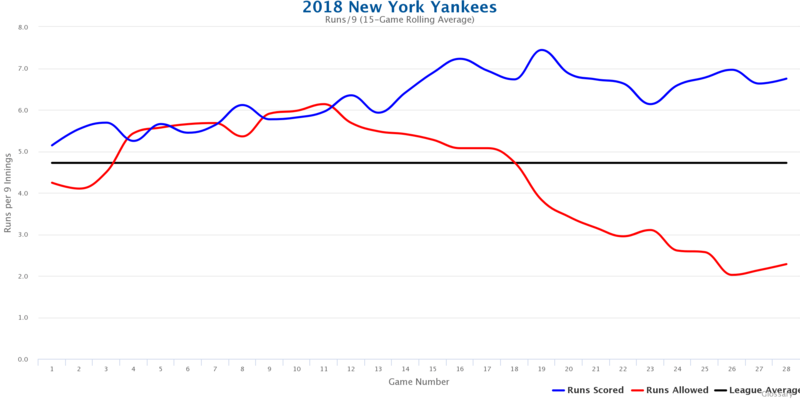 In terms of keeping runs off the board, the real 2018 Yankees are probably closer to the team we’ve seen these last two weeks than the team we saw at the start of the season.